Headquarter Signal Training Center Kohat has announced New Jobs in Daily Express Newspaper 15.04.2018. 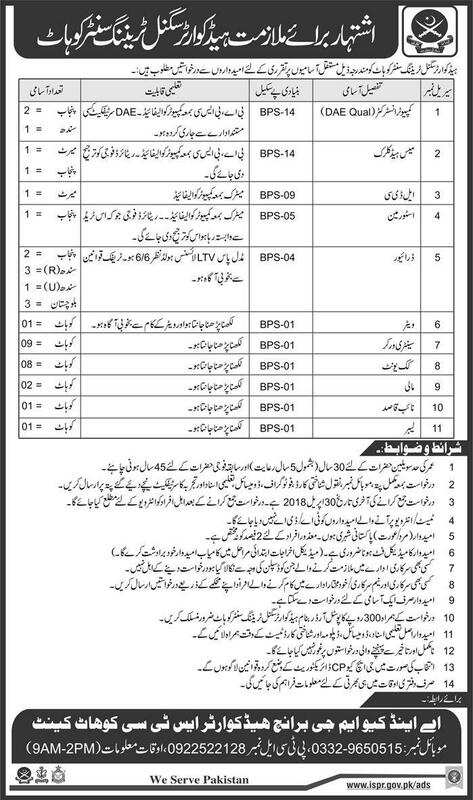 Candidates can apply for Military Signals Training Center Jobs 2018 against Computer Instructor, Mess Head Clerk, Lower Division Clerk, Store Man, Driver, Waiter, Sanitary Worker, Cook Unit, Maali, Naib Qasid and Labor. Candidates should be medically fit for which Expenditures for medical Test Candidates himself bear. Applications along with all testimonials should reach in the office of A&Q M.G Branch Headquarter STC Kohat Cant. Candidates who are Discharged from any government department on disciplinary Actions are not allowed to apply. Headquarter Signal Training Center Kohat 38 Jobs Daily Express Newspaper 15 April 2018.